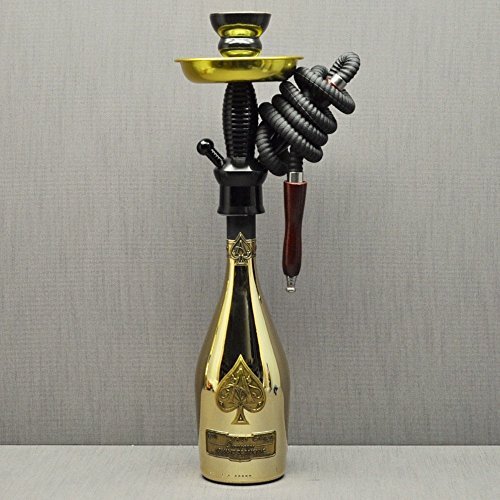 This Listing is for a Custom Bottle Hookah made using an Empty Armand De Brignac (Ace of Spades) Gold .750L Champagne Bottle. This Item Includes a classic ceramic Bowl Black and a classic wood handle Hose in black and Tongs. If you have any questions or concerns please feel free to contact us. No Liquor! Recycled Bottles Used To Make Hookahs! One of a kind Hookah! If you have any questions about this product by Al Moonla, contact us by completing and submitting the form below. If you are looking for a specif part number, please include it with your message.